BBC election set green screen Jump to media player Jeremy Vine shows us around the BBC election green screen area. BBC election studio big screen Jump to media player Emily Maitlis will be monitoring the exit polls and all the results as they arrive using a six-metre touch screen. BBC election studio set timelapse Jump to media player Timelapse video of the BBC election studio set being put together. BBC election studio results team Jump to media player The engine driving the BBC's election analysis is a team of psephologists - people who study elections. The Election 2015 studio is at the BBC Elstree site north of London. Part of the Election 2015 studio is given over to a huge green screen area. 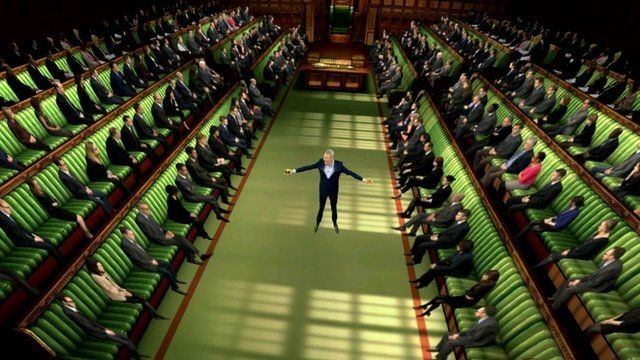 Here Jeremy Vine will be able to walk among three-dimensional graphics to explain how the political parties are faring in their key battlegrounds and how the chamber of the House of Commons could look as the distribution of MPs becomes clear. This video shows Jeremy in action.